A machine built to accomodate resistance must be designed to withstand a tremendous amount of stress! It must be constructed skillfully as there is no room for sloppiness or error - all parts must fit together accurately and tight. All parts must be glued and screwed. 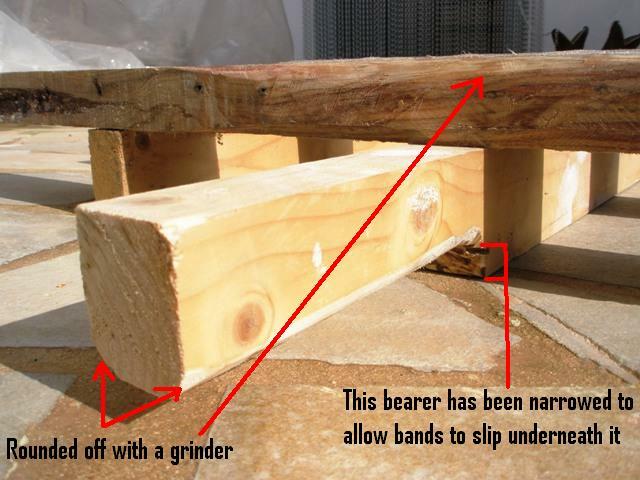 All joints and corners must utilize adequate bracing and reinforcement. 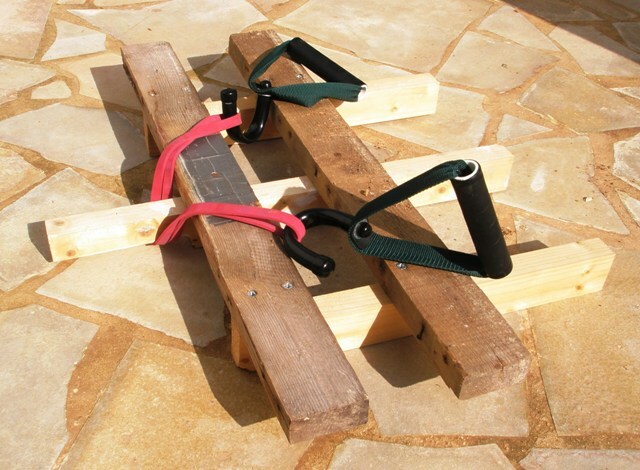 Build a resistance machine with the thought in mind that it will support an elephant! Here are some ideas for wall mounted spring machines. When building a machine of this nature it is essential that all screws holding the machine to a wall be dead center of the wall studs and perfectly straight into the wall studs. These machines are constructed with 2 x 4's with joints being created by offsetting 2 x 4's on top of one another. 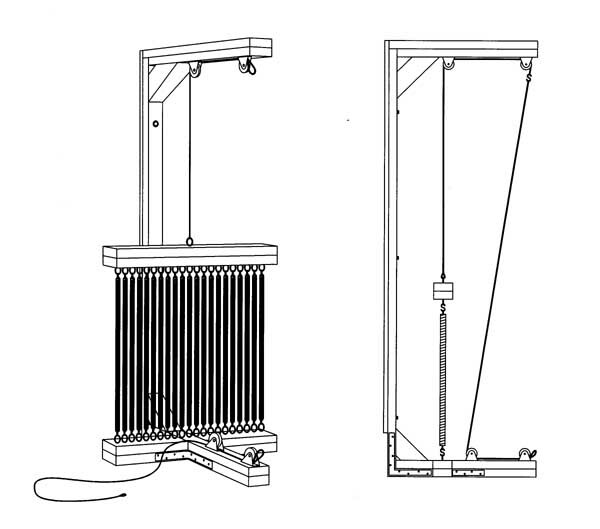 Steel reinforcement isn't depicted at the top to demonstrate how the 2 x 4's are placed to create a joint. The 1 x 4 in the back of the machine serves as a spacer to clear a baseboard at the bottom of a wall. It also reinforces the joint at the top. 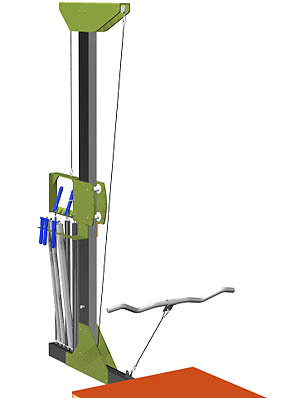 Here's another version of this machine utilizing the 'block and tackle' concept. The main advantages here are that one cable remains continuously taut, there is no attaching and detaching cables, you have twice as much pull distance, and there is distance between both pulleys and the springs - more, if you want. The disadvantage is that the amount of resistance is cut in half, but you can build this with as many springs as you want. You can even utilize garage door springs. It also utilizes more pulleys, but, hey! It will last a lifetime! Stain and polish it, and, whoa!! 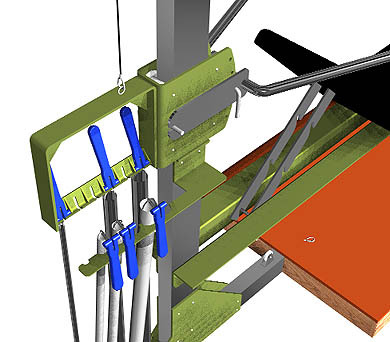 Because the springs are closer to the back, you really couldn't use steel reinforcement or a 45 degree brace as shown on the model above, but you could glue and screw 3/4" or 1" plywood to the sides as shown in the detail and that should make it strong enough. 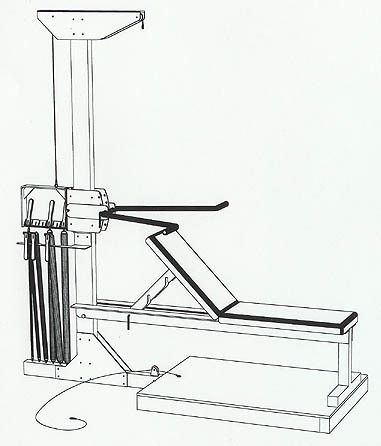 The machine depicted here can be utilized for bench presses and squats. 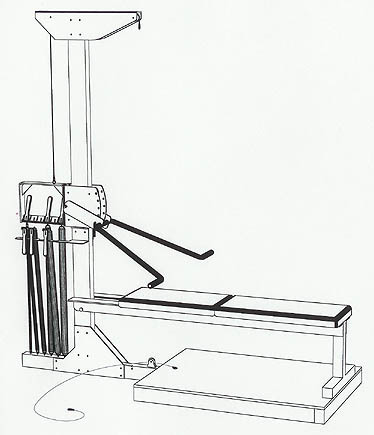 Here's a sketch depicting a simple bench press machine. The spring set up is, of course, repeated on the other side. 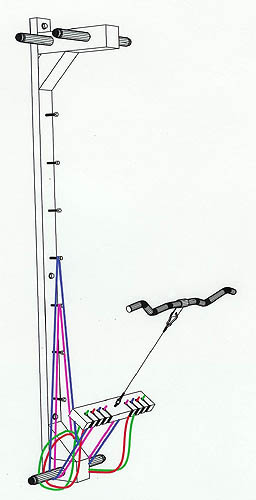 This machine shows the spring setup as being detachable. It could be used on other machines. 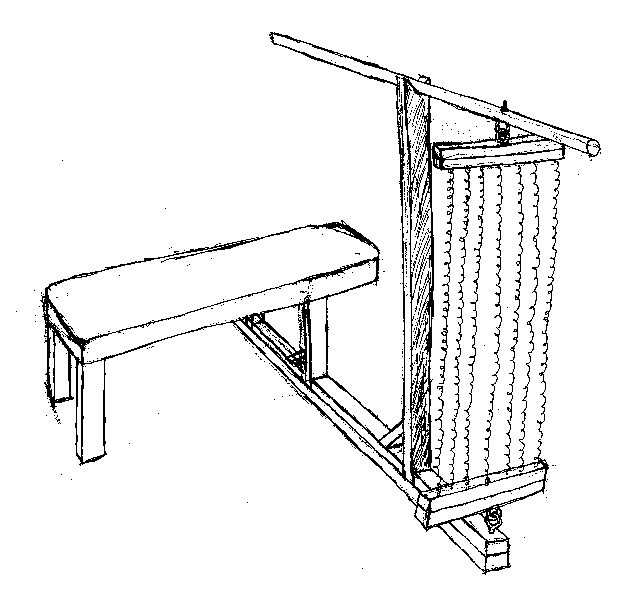 The machine depicted at the top, for example, could be designed with a detachable spring setup. Looking at this sketch, now, the supports really ought to be set back so that the centerline of the spring setup is directly over the user. Well, that's why we do sketches. The World's Fastest Loading Cable Exerciser! It's just made from scrap timber. It could be prettier but I really dont give a %#@& about that for this kind of thing. I mostly loop the bands at the front as shown but the bands can also be looped under at the sides instead to perform a suit case lift. Oh and yes I do use more than just the red band. That was just for demonstration purposes. If I loaded my usual amount of bands on you would hardly be able to see the platform under the mass of bands. On this machine, the Lifeline cables are attached to a 12” 2 x 4 through 5/8” holes drilled down the middle of the 2 x 4 and spaced 1” apart, 6” apart at the center. 1/4” slots are cut into the holes to allow installation of the cables. All edges are rounded and smoothed. 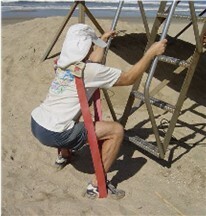 An eyebolt is secured through the center of the 2 x 4 for weight machine attachments. The cables loop around 18” x 1” steel pipes that run straight through the top and lower 4 x 4’s which are surrounded by rotating 1 1/2” PVC sleeves cut to size and held in place by caps on the ends of the steel pipes. These serve as pulleys. Four cables combined with seven 5/16” hex head wood screws spaced evenly along the vertical 2 x 4 allows combinations of dozens of resistance levels. 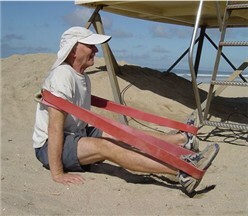 The cable/2 x 4 device can be moved between the low and high pulleys for lifting and pull down exercises. The device can be made to accommodate as many or as few cables as desired. Cables with handles can also be used on this machine. With this machine, the resistance begins right at either the bottom or the top, because once you've made your settings, the cable holder is drawn up tightly against either the top or the bottom extensions. 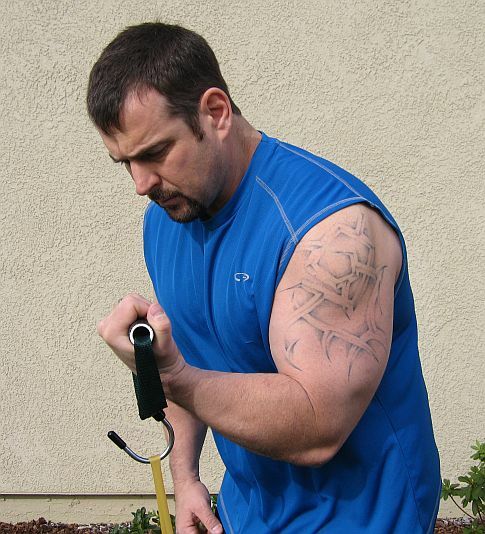 From there, you connect whatever lifting attachment you're going to use; curl bar, lat bar, triceps bar, etc. So, it's just like having a weight-stack machine with a high and low pulley, except that the resistance is provided by cables rather than weights. . Also, with the top extension extending out, you can get right under it for pull downs or lat pulls. You could put a chair under it. Instead of drilling holes and cutting slots, the cable holding device could be set up with a string of eyebolts for cables with hooks. In this case, a wooden dowell instead of a 2 x 4 could be used. 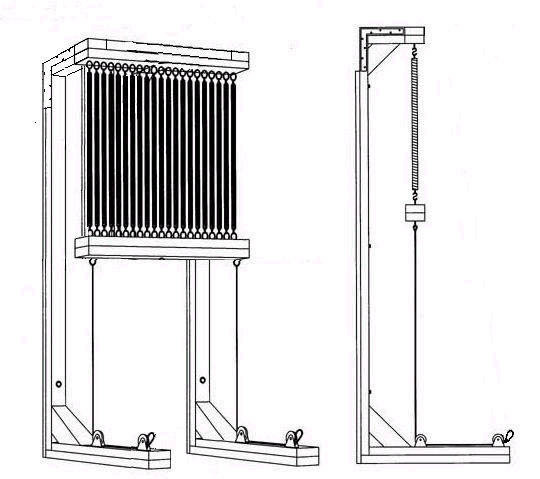 See the Cable Booster below. I made the device shown here so that I could utilize curling and triceps attachments with my Lifeleine TNT Cables. I loop the cables over either a high or low heavy-duty hook in my wall. 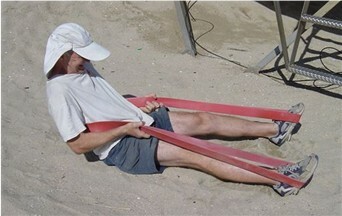 Here are some examples of exercises that can be performed utilizing long elastic bands. 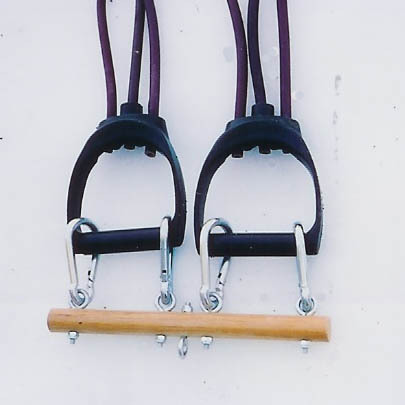 The bands pictured here were purchased from Jumpstretch. Obviously, this machine isn't something you would build with some wood and a few tools. If I had the money and the know-how, this is the machine I'd like to have. The springs that are being unused rest in countoured recesses in a tray. 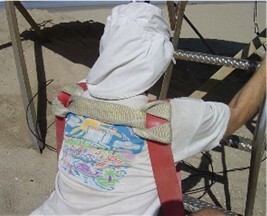 The springs being used are drawn up tightly into the carriage and locked into place by handles utilizing a cam action. There are six springs; 100 lbs., 50 lbs., 40 lbs., 30 lbs., 20 lbs., and 10 lbs. which provide from 10 to 250 lbs. of resistance in 10 lb. increments. The amount of resistance could be increased by using heavier springs.